OUR VERDICT: The camera's auto-focus coped superbly with fast-flying gulls and the excellent images had top-quality colour, contrast and sharpness. A couple of years ago I reviewed Nikon’s D3s camera. I was amazed at the quality and couldn’t see how it could be bettered. To me it was the ultimate camera; then the D4 arrived. At first glance, Nikon appears to have kept faith with its trusted design: nothing seems too different and the camera has the usual great feel to it. On closer inspection there are a number of subtle differences. Gone is the metering choice dial, with metering instead set via buttons; gone is the AFC/AFS switch, now controlled by a central button and command dial; gone also is the need to use two hands to enlarge the image on screen by pressing a button and turning a dial, with a single ‘plus’ button instead – a great improvement and the same design as in the D7000. The screen is larger, at 3.2 inches compared to three, and the two CF memory card slots have been replaced by one Sony XQD slot and one CF slot. This is a full-frame body (FX in Nikon speak) which means there is no crop factor, so the lens in use is ‘what is says on the tin’; for the purpose of the test it was my Nikon 500 mm f4. But there is a choice of built-in crop modes, either 1.2x or 1.5x; these use fewer pixels than at full frame. 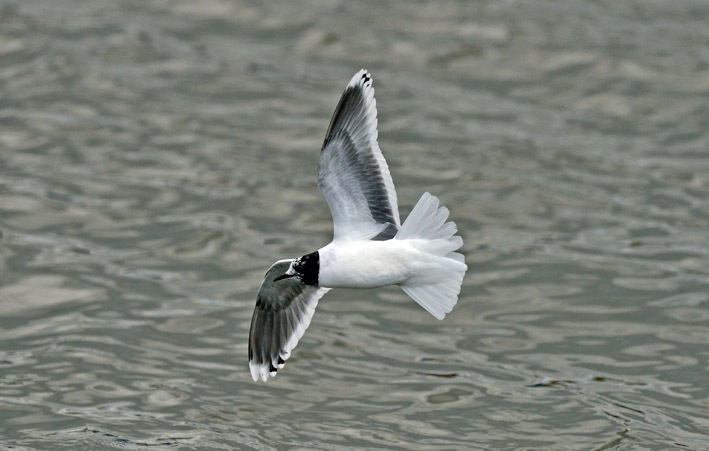 The arrival of the review model coincided with the return of Little Gull passage at Seaforth. Missing for the last couple of years, these fast-flying gulls would be an excellent test for the camera’s AF system and the 10 frames per second (FPS) firing rate. at ISO 2,500 with a 500 mm lens; the noise is hardly noticeable. Most of the test images were taken between ISO 1,250 and 2,500 and were amazingly good at this speed; noise was less obvious than on the D3s, with a ‘smoother’ look. Auto white balance worked perfectly and the FPS rate was very useful; the fast Sony XQD card easily kept up with the shooting rate. The AF sensor has been significantly improved, and when using a 1.4x converter with the 500 mm lens there was virtually no difference in the AF speed despite being a stop slower. The quality of the images taken with the 1.4x was a vast improvement on those taken on the D3s. The AF also worked, but more slowly, when using a 2x converter, even following the Little Gulls in flight and locking on – an unexpected bonus. The images looked excellent when viewed back home, although the RAW files are around 25 MB so will soon fill hard drives. Colour, contrast, noise and sharpness were all top quality, as you would expect from this model. My only criticism is with the new battery: it doesn’t last as long as that in the D3s, although it still manages a full day’s shooting. Eyebrows will be raised at the price, but you have to remember this is a professional camera, designed for heavy use on a daily basis and is priced accordingly.